On the back of the company’s recent success at the Telstra and Australian Government Small Business Awards, CommtechWireless CEO Nathan Buzza was last night declared the Western Region Entrepreneur of the Year for 2005 in the Technology, Communications, E commerce and Life Sciences category. The story of NathanÂs success is nothing short of inspiring. At the age of 14, brain surgery threatened to quell his enthusiasm for life. Instead, Nathan created a software company called ‘Data World’ and developed a video game that was distributed worldwide by Philips Electronics. It was this hospital stint that gave him the inspiration to create a wireless messaging system to revolutionise the speed and efficiency with which staff in a hospital can communicate. He witnessed, first hand, the hectic pace of life in a hospital wing and knew that a faster way of receiving messages would save lives. Nathan established CommtechWireless in 1992, at the age of just 21. After resigning his job as R&D Manager of Austco Communications, Nathan invested his entire personal savings to start CommtechWireless in a garage in the suburbs. His revolutionary idea, that a computer could exist as part of a communications network, came into its own in 1993 with the release of Nathan’s CommtechMessenger platform a software program that integrates clinical alert notifications with mobile devices. Tirelessly improving and increasing the company’s product range, Nathan expanded the spectrum of the market place he served. Some of the innovative products developed by CommtechWireless include; a restaurant paging system using electronic coasters, alarm relays that send messages to pagers during an alarm event, 4 line alphanumeric pagers with various tone settings for priority notification and software that takes data from casino slot machines and monitors their status. ‘Nathan’s innovation now propels a company whose turnover exceeds $ 15 million and provides safe and effective messaging to health care, aged care, hotels, restaurants, mine sites, emergency services, casinos, retail environments, corporate environments and government departments all around the globe. In 2002, Nathan was awarded the Western Region Young Entrepreneur of the Year Award. 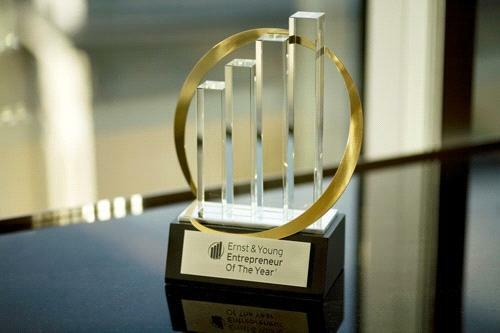 Three years later, Ernst & Young have once again recognized Nathan’s achievements Â as have many other companies, with CommtechWireless receiving innumerable awards including the CY O’Connor Award for Excellence in Engineering & Technology. Nathan will now represent Western Australia in the National Entrepreneur of the Year Awards being held in Sydney on the 24th of November. In his acceptance speech at last night’s awards ceremony, Mr. Buzza thanked Ausindustry for their support in last year awarding CommtechWireless a substantial grant to help fund their innovative Research & Development department. He also gave special mention to his tirelessly dedicated team of staff.